Privet-pulling wilderness workday, January 28! Saturday, January 28, day two of our Winter Warmer Weekend. Don’t miss out! Be part of this important work of removing non-native invasive plants from our wilderness. 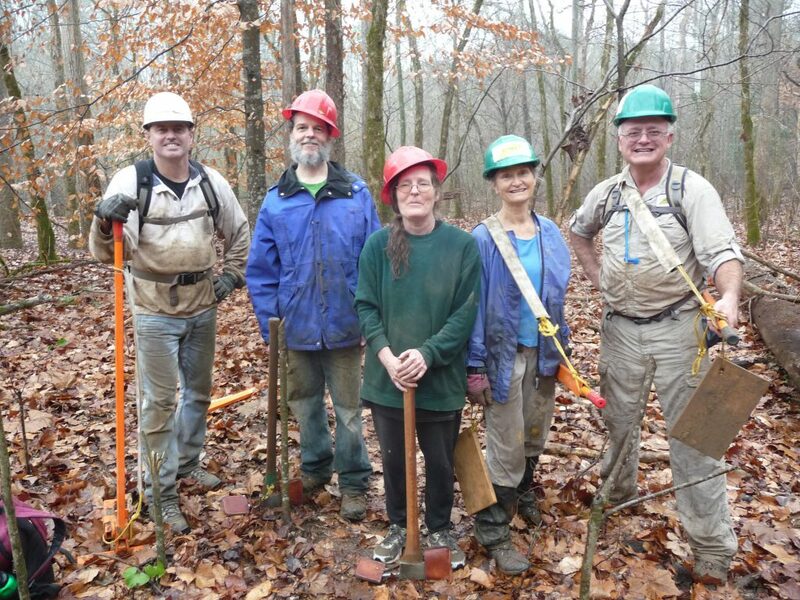 And, if we can get some crosscutters signed up, a small group of volunteers will tackle a blowdown on Trail 209 between Trails 204A and 204 on Jan. 28. If interested, let us know when you sign up. Meet at the Wild South office in Moulton at 8:30 a.m., unless meeting at the Thompson Creek Trailhead works better for you. Expect to hike about 5 miles roundtrip while carrying tools. Privet-pulling is physically demanding work that requires hiking, stooping, and pulling privet plants out of the ground and hauling them out of the flood plain. Bring a backpack with lunch, snacks, drinking water; a hardhat if you have one; work gloves. Wild South provides all tools and personal safety equipment. Wear clothes suitable for hiking and the weather. Long sleeves, long pants, closed-toe sturdy boots or shoes are recommended. The folks in the pictures said to let others know they can expect to get VERY DIRTY.